GAZA/JERUSALEM, July 20 (Reuters) - Israel said on Sunday it had expanded its ground offensive in Gaza and militants kept up rocket fire into the Jewish state with no sign of a diplomatic breakthrough to end the worst fighting between Israel and Hamas in two years. Gaza residents said land and naval shellings were the heaviest in 13 days of fighting. Explosions rocked the coastal enclave overnight and shells fired by Israeli naval forces lit up the sky. Israeli tank shelling killed one Palestinian and hit houses in the northeastern Shejaia district, where residents called radio stations pleading for evacuation. An Israeli air strike there on the house of senior Hamas official Khalil al-Hayya killed his son and daughter-in-law and two children, hospital officials said. Near the southern town of Rafah shelling killed four Palestinians, health officials said. In Israel, sirens sounded in towns near Gaza, warning of approaching rockets. 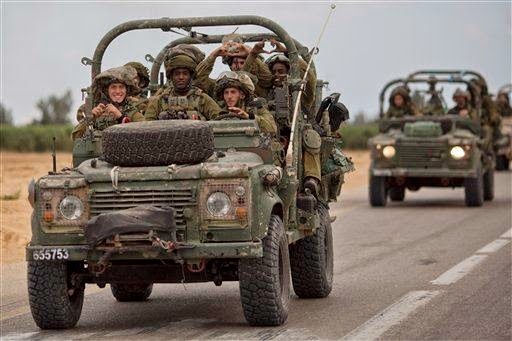 Israel sent ground forces into Hamas-dominated Gaza on Thursday after 10 days of heavy air and naval barrages failed to stop rocket fire, some of which reached deep into Israel, from the Palestinian territory. The military said in a statement on Sunday it had sent additional forces into the Palestinian enclave. Israel has vowed to destroy a network of tunnels out of Gaza and hunt down the militants' stockpiles of missiles. Gaza officials said at least 345 Palestinians, many of them civilians, have been killed in the 13-day conflict. On Israel's side, five soldiers and two civilians have died. Diplomatic efforts to secure a ceasefire involving, among others, Egypt, Qatar, France and the United Nations, have failed to make headway. Qatar was due to host a meeting between Palestinian President Mahmoud Abbas and U.N. Secretary-General Ban Ki-moon on Sunday, a senior Qatari source told Reuters. Ban was due during the week to travel to Kuwait, Egypt, Israel, the Palestinian Territories and Jordan, a U.N. statement said. The Qatari source said Abbas was also due to meet Hamas leader Khaled Meshaal. Western-backed Abbas in April struck a deal with Islamist Hamas that led to the formation of a Palestinian unity government, seven years after the group seized control of Gaza from Abbas's Fatah party. Hamas has rejected Egyptian efforts to end fighting, saying any deal must include an end to a blockade of the coastal area and a recommitment to a ceasefire reached after an eight-day war in Gaza in 2012. Egypt said on Saturday it had no plans to revise its ceasefire proposal. A Hamas source in Doha said the group has no plans to change its conditions for a ceasefire. Israel is wary of mediation by Qatar, which hosts a large number of exiled Islamists from across the Middle East including Meshaal, and Israeli officials have said Egypt must be a party to any ceasefire deal. French Foreign Minister Laurent Fabius, who flew to Israel after meetings in Egypt and Jordan, said on Saturday efforts to secure a ceasefire had failed. "On the contrary, there's a risk of more civilian casualties that worries us," Fabius said, after talks with Israeli Prime Minister Benjamin Netanyahu in Tel Aviv. Hostilities between the two sides escalated following the killing last month of three Jewish students that Israel blames on Hamas. Hamas neither confirmed nor denied involvement. The apparent revenge murder of a Palestinian youth in Jerusalem, for which Israel has charged three Israelis, further fueled tension. Israeli bulldozers and engineers worked along a 1.5-km-wide (one-mile-wide) strip of Gaza's eastern frontier, uncovering 13 tunnels, at least one of them 30 meters (90 feet) deep, military spokesman Lieutenant-Colonel Peter Lerner said. About 95 rocket launchers were also found and destroyed in the sweep, he added. Searches were continuing in what he described as an open-ended mission that had "severely impeded Hamas capabilities". Israel says more than 1,700 rockets have been fired out of Gaza during this month's fighting, and between 3,000 and 4,000 destroyed in military strikes - together almost half of the militants' original estimated arsenal. Hamas says it is continuously replenishing its stock of weapons and is ready for a prolonged conflict. The Israeli death toll has been kept low due to the rockets' relative inaccuracy, a network of air raid sirens and shelters and the Iron Dome rocket interceptor's 90 percent success rate. The Israeli military urged Palestinians to flee a growing area of Gaza ahead of further military action in the Mediterranean enclave. Residents say about half of the territory's 1.8 million population have been told to move. With both the Israeli and Egyptian borders sealed off, Gazans say they have few places to escape to.